Streetglo Decals and more Decals. 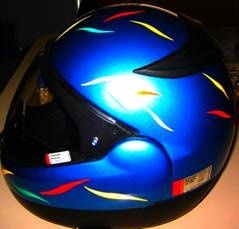 Reflective Decals for all vehicles and motorcycles. Reflective Decals can be used as Car and Truck Decals too! guy or a really hard line gal! 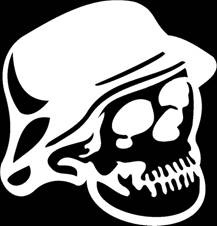 The Bone Shaker skull decal is the skull for the rough and tough crowd. 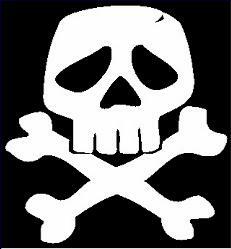 StreetGlo's version features crossbones that could pass for cross wrenches should you so choose to see it that way! But if you want bones, these are most surely bones, forget the wrench idea, we shouldn't have even mentioned it! Available in 3.3 and 4 inch wide models. The ideal accent to your decal project! 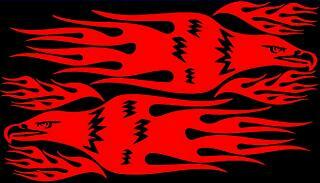 Flame Decals accents can be used to enhance your decal project or buy several colors and design a decal kit based on flames like the on the decal photo featured to the left. You get 18 flame decal accents on a sheet. 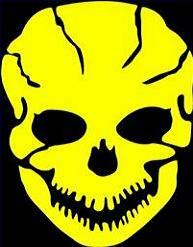 Helmet Head decal works in all colors, but it works best in black or white. If you want another color for this decal, please, by all means... We make them in all colors and they look cool. 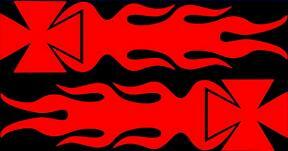 Decal Size 3" x 3"
Our Maltese Cross Flame decals come in a set of 2, for each side of a helmet. They look great also as a tank flame accent decal or saddle bag decal. You can order these also in multiple sizes for a variety of decal applications. This decal features the best of both. 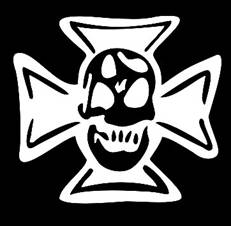 You get the maltese cross decal with the image of a skull decal inside of the maltese cross decal. A wonderful combination for the darker side of you! This decal's a little on the big side but it installs easily on a helmet by cutting the application tape away between each branch of the maltese cross decal. Check out our decal installation videos! Decal measures 3.9 x 3.9"
This Flaming Eagle on Fire decal looks great on a helmet, tank, car or truck. If you want two of them, just put a quantity of 2 in your shopping cart and we'll automatically send you facing left, facing right versions. This decl is eay to install and uses a wet system for ease of decal installation. Tank or Saddle bag sized - A full set! THis Eagle on Fire decal - Flaming Eagle decals set is larger and wider for tank or saddle bag decal installation. Of course, you can use this on a car or truck too! Not designed for helmets but it will fit most helmets as well. Welcome to StreetGlo's reflective Helmet sticker and helmet sticker catalog. These stickers are great for Auto Window Sticker applications too such as ....Truck stickers and Car stickers.